I remember as a young lass that meat from the butcher’s was wrapped in greaseproof paper and then maybe in butcher’s paper and then popped into a brown paper sack. I remember cheese was cut from a block and also wrapped in paper. I remember mum had string bags and we used those when we shopped, but I also remember that the fruit and veg man used to drive around and home deliver from a truck as did the milk man. Food was more local back then I guess and so packaging was not as necessary to keep food fresh for long haul distribution. I found it fascinating that my mum was born in the year that they discovered/invented cellophane, but before that there had only been a handful of plastics developed—most notably Bakelite which had all sorts of industrial and then later, domestic applications. My parents had an old Bakelite radio that they gave to me and I cherish to this day. Tupperware came out in the 1940s and was a bit of a hit because of its distribution method—AKA the party plan. I remember my mum bought into it—we had various configurations of Mr Tupper’s containers in the cupboards, and I recall being intrigued through my life, how Tupperware seemed to be timeless… The company survives to this day, but the iconic green sculpted jelly mould is a stand out in my memory. I can’t remember eating any jelly made in such a mould, but I knew several people who had that particular piece. I was born in the year Bubble Wrap was invented. That made me smile. Like many people I love popping bubble wrap so that we share a birth year is nice, but for me it almost marks the beginning of the end, because around this time (the 50s and 60s) the first plastic disposable cups appeared and in the 70s plastic bags proliferated in supermarkets. Ah, convenience! In fact, there is an iconic article published in Life Magazine about ‘Throwaway Living’ (see: http://life.time.com/culture/throwaway-living-when-tossing-it-all-was-all-the-rage/#1). The key idea was that the convenience of plastic would obviate the drudgery of having to clean anything—you could just simply throw it away. The sad thing, on closer analysis is that there is NO away…(AKA this planet is a closed system…think about it). Back at the timeline, CAD CAM made it possible during the 80s for the types, sizes and design of plastic bottles to only be limited by imagination. I blame CAD CAM for my least favourite aisle in the supermarket. That and consumerism…and marketing companies… Sigh. In the mid 80s somehow we developed a love affair with being hydrated and what had been an exclusive line of water e.g. EVIAN in glass (and that IS naive backwards BTW!) was now available for us, the unwashed masses—in plastic bottles. Up until then we had bought many beverages in glass and aluminium and I guess soft drinks came out in plastic bottles as well, but at some point we started this insane obsession with water in single-use bottles. If you are at all vaguely interested in this, Annie Leonard and her crew do an outstanding animated piece on bottled water in the Story of Stuff Project (see: http://storyofstuff.org/movies/story-of-bottled-water/). Don’t get me wrong, I think plastic is amazing and has been put to some incredible uses—prosthetics, all sorts of single-use medical applications which ensure better infection control; plastics has been employed in all sorts of commodities—from commercial and domestic use, including bits and bobs in cars, etc etc. BUT SINGLE USE PLASTICS? Arghhhh. Among these are the plastic shopping bags, the bin liners, the plastic coffee and drink cups and any and all plastic plate and cutlery combinations—NONE of which is recoverable or recyclable on any meaningful scale. While I am on recycling, here’s my beef. You know that little trilogy of bent-arrows that indicates recycling. That has been adapted and adopted by the plastic industry in an effort to make plastics look more green—pretty much the best example of greenwashing you can imagine. 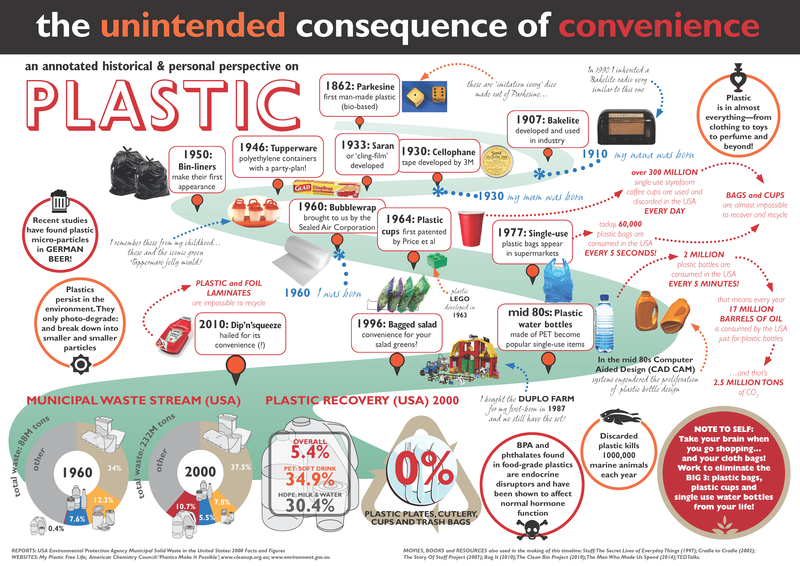 The statistics bare out that most plastic waste is not recoverable. This can be down to contamination (contact with food, faeces or other—remember that baby and adult nappies have a high plastic component) or that the plastic itself is not recyclable (e.g. Vinyl at 0%). According to some sources, the highest recovery rate for this group is the PET plastics (1) that come in around 20% with all others at 10% or way less. Polystyrene (6) comes in at 0.8% (the American Chemistry Council’s figures are much higher). The reality is that the plastics industry would prefer not to deal with degraded plastics, but some is recovered and reused and shows up as clothing and wood alternatives and in other imaginative ways. 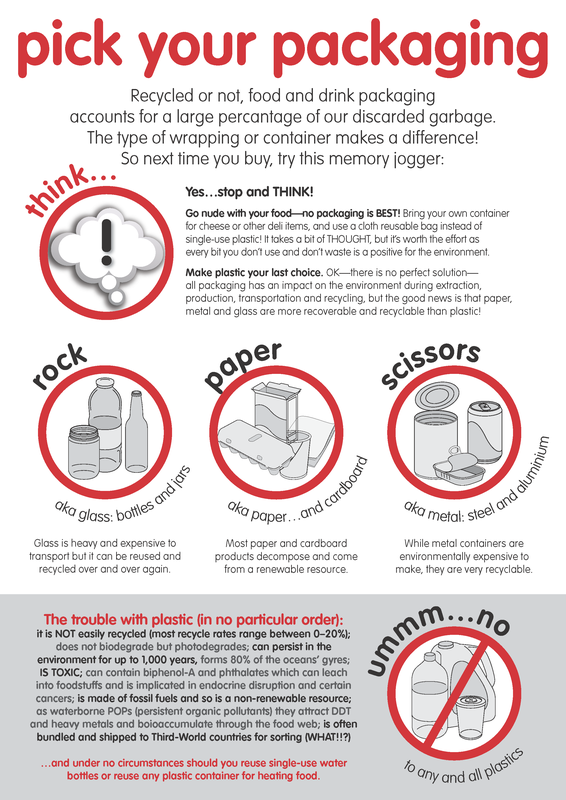 But, for the most part, plastic and plastic waste is buried or bundled. When buried, plastic can potentially last for forever as plastics don’t biodegrade like metal or organics—they incrementally break down under the sun (so photo degrade). When bundled, most of the plastic it seems gets shipped from countries that can no longer afford the space for a growing amount of waste as landfill, to poorer countries for ‘processing’. This is a disgusting thing to do—to strap into large blocks, squashed PET and HDPE bottles along with any and all contaminants to be picked through by people who earn less than $2 a day as a salvage operation. I sit here clenching my teeth in anger that this is some sort of acceptable ‘solution’. When plastics escape (sounds like the title of a good horror movie), as they are lightweight, they tend to blow around and float. It should come as NO surprise that plastic has become one of the biggest environmental hazards in our waterways and oceans. The statistics are shocking but there are various sites that are worth checking out (see: http://www.cleanup.org.au/au/; http://www.plasticoceans.net; http://www.marineconservation.org.au/pages/plastic-pollution.html; and http://www.greenpeace.org/international/en/campaigns/oceans/fit-for-the-future/pollution/trash-vortex/). Two points worth a mention. 1: Plastics interfere with wildlife by either being mistaken as food and ingested, or as a choking/survival hazard. 2: As plastic floats in this marine environment and photo degrades to smaller and smaller pieces, these pieces act like mini magnets to any heavy metals and toxins in the environment. They become POPs (persistent organic pollutants) and, mistaken as food by fish, are ingested. These metals and toxins then become part of the food chain, and accumulate as bigger fish eat the smaller fish which have eaten the even smaller fish. This is one hell of a health hazard as you consider we are atop that food chain. One other health issue is the potential harmful side effects of additives—specifically Biphenol-A (commonly known as BPA) and phthalates. These chemicals are used to harden or soften plastics for various applications. 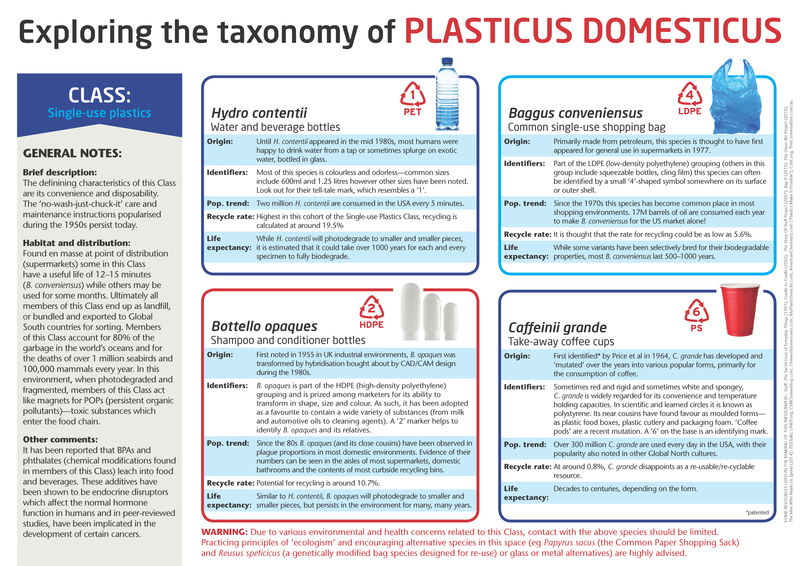 It has been shown that there is potential for these to leach into food and beverages from the plastic containers, and as endocrine disruptors, they affect the normal hormone function in humans. In peer-reviewed studies, BPA and phthalates have been implicated in the development of certain cancers. Another BIG sigh. Statistics that I found on the United States EPA website are so interesting (see: http://www.epa.gov/osw/nonhaz/municipal/pubs/report-00.pdf). In 1960, plastics comprised 0.4% of the total volume (by weight) of municipal solid waste (MSW) in the USA—the grand total of all waste coming in at 88 million tons. By the year 2000, MSW had almost tripled in size (up to 232 million tons) but two things stand out to me: the population of the USA had, over the same time, only increased by just over 50% AND (here’s the kicker) the amount of plastic in this now even bigger per person waste load, had increased by a whopping 260% (from 0.4% to 10.7% in 40 years). This is even more gobsmacking when you consider that plastics, as they have been developed and refined over the years, have become lighter and lighter—one of their ‘selling points’, so the volume of that wasted plastic, as a physical blob, is incomprehensible to me. I don’t feel like I am a bad person, and yet my house is FULL of plastic. I can’t change it overnight, but little by little I am changing my approach to what had become a lifestyle of plastic-wrapped convenience. And to those of you who have read through this to the end and are concerned that I do go on these rant adventures, take heart that it is a cathartic process for me. I need to get it down and if in the process it helps someone else, or brings clarity to another then that’s a plus. When asked by a friend recently, why I had to keep on about the things I am learning, my response was: ‘I can’t un-know what I now know’. I cannot un-see the elephant that now stands in the middle of my consciousness. MOVIES, BOOKS and RESOURCES also consulted in research: Stuff: The Secret Lives of Everyday Things (1997); Cradle to Cradle (2002); The Story Of Stuff Project (2007); Bag It (2010); The Clean Bin Project (2010); The Men Who Made Us Spend (2014); various TEDTalks. And to end…the other two ‘woulda-beens’ that I did not submit…I hope you find something of use among my words!